"Don't worry," I said. "These men are good. They're going to save the world." After YEARS of hearing the most amazing things about Snyder and the books she writes, the worlds she creates and the characters she breathes life into, i finally got myself one of her books! And i am kicking myself very hard for not doing so sooner! Avry is on the run, she is a healer. Her touch has the power to heal the injured and the ill. You would have though that the power of healing would have the healers being worshiped and loved amongst the people. Instead they are hated and hunted, blamed for spreading the plague that wiped out thousands leaving the survivors in a state of fear and chaos. 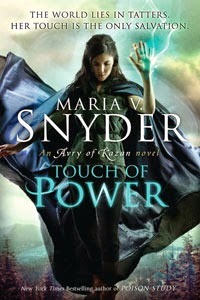 Avry is rescued/kidnapped by a gang of rebels, they need her power to heal their leader. The problem with that is, he has the plague. For a healer to heal someone of the plague would mean their death. When a healer uses their power to heal someone they take the persons ailment into their own body, healer's bodies heal much quicker and are able to survive things that normal people wouldn't be able to, except from the plague. They can cure someone of it but they cannot recover from it. So Avry is torn, knowing that the plague will kill her and the gang's need to have their leader healed leaves Avry with a lot to think about.. The gang really are a lovable bunch! Kerrick, Balen, Loren, Quain and Flea. Avry quickly develops friendships with all bar Kerrick, the leader of the group. Him and Avry constantly but heads and it's brilliant! The two constantly snark at each other and argue and it really is a highlight of this book! The characters in this book are so entertaining! I loved them all and found myself really caring about what happened to them, laughing along with their jokes and getting sucked into all their antics! Throughout this book their all constantly on the move, trekking over the nine mountains trying to reach their friend. But a price has been put on Avery's head and the gang have mercenaries chomping at their heels and magical dangers, dark and repulsive are waiting round every corner. Not only do they have to face with danger, kidnapping, the undead, they will have to face themselves and the choices they make and the effects they have. They will trust the wrong people, fall in love, have the most hilarious antics, forged friendships where strangers become family and face a ton of danger! Avry will come to realize that sometimes those who share blood cannot always be trusted. Now i'd like to take a moment to appreciate all that is Tohon. I know, i know he's the bad guy! But he's a hot, swoony badguy who makes darkness seem much more appealing. Honestly he reminded me so much of the Darkling, and he is just another example where evil is a pant dropper. I loved his character, he really made a brilliant villain. He was unpredictable, you never knew what he was up to or what his next move would be. Even if he was psychotic everybody's got to have one flaw right? I didn't want to go into the plot in my review because there are so many unexpected twists and turns throughout the plot that it will most definitely keep you flipping them pages and have you falling deeper and more in love with the story with every chapter. Snyder is a fabulous creator, from the world building to the characters to the high impact action scene this is a book not to be missed by fans of fantasy! This is my favorite book of the series and the only one that is Avry's sole POV, the following two in the series are dual POV. You'll only be hurting youself by missing out on this series, fans of fantasy get ready to join a thrilling adventure that will leave you with a thirst for more..
Oooh... it sounds really good. I friggin' love the cover. I'll have to keep it in mind.